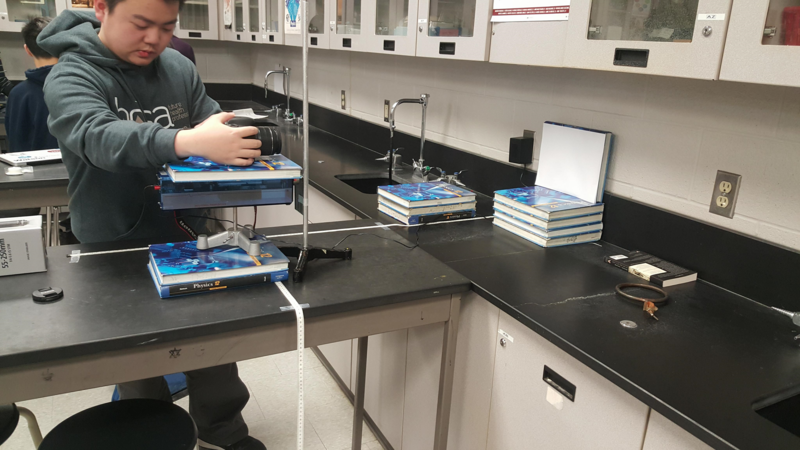 On the last day of school before the winter holidays, the grade 12 AP Physics C students worked diligently in the lab from 12 pm to 5 pm on a challenging series of experiments related to quantum mechanics. These experiments were of their own design. They first were required to use diodes to obtain a value for Planck’s constant. Then given this value and the results of the single photon experiment, they took images of a single slit diffraction pattern and after analysis will derive the uncertainty principle. The final experiment was to obtain a spectrum of the light from an incandescent bulb and after calibrations (including the chip in their digital camera) obtain a value for the temperature of the filament in the bulb. Their paper is due in mid-January. In the early part of the experiment, these students were surprised by the Principal who brought in festive red popsicles for the students out of respect for their commitment to their work on this last day of school.